Not for LotFancy blood pressure monitor. Compatible with Omron 5 series / 7 series / 10 series / 10 series+ upper arm blood pressure monitor. Omron 5 series upper arm blood pressure monitor model BP742, BP742N, HEM-742int, HEM-704C. 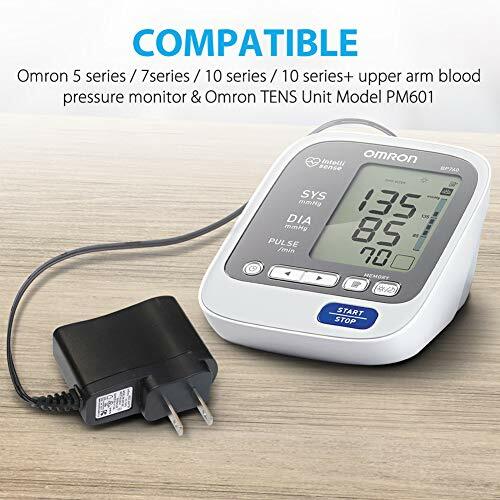 Omron 7 series upper arm blood pressure monitor model BP760, BP760N, BP761, BP761N, BP760, BP654, BP652 (HEM-7220-Z). Omron 10 series upper arm blood pressure monitor model BP785 (HEM-7222-Z). Omron 10 series+ upper arm blood pressure monitor model BP791IT, BP785N, BP785, BP786N, BP786, BP791 (HEM-7222-ITZ). Reliable: 100% compatible with original ac power adapter.